I am a big fan of Google and a bunch of their web apps like Gmail, Google Reader, etc just like any other techie. I kept hearing about this book on Google from a lot of podcasters. 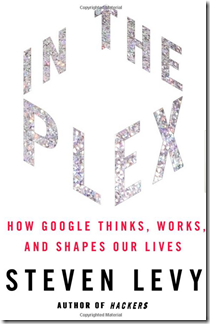 So, I finally caved in and downloaded the audiobook on Audible – In The Plex: How Google Thinks, Works, and Shapes Our Lives . This book takes us into the beginnings of this startup when Larry & Sergey ran Google in the dorms of Stanford University. You will learn about the inner workings of the company, the roots of its famous oh-so-different corporate culture, what drives the company, how they can scale so well when others falter, etc. Steven Levy (senior technology writer for Wired magazine) takes us in a fantastic journey and I was thrilled to learn a few tidbits like Larry wanted none other than Steve Jobs as Google’s CEO. Larry was born in Lansing (where I live now) and he went to Okemos Radmore Montessori. This is a must read for anyone who secretly admires Google for what they have become and what they could be few years down the road.